he sweet earthiness of the golden beets, along with the salty blue cheese, nutty arugula, tangy tangerines, and pungent olio nuovo olive oil make this salad a virtual party in your mouth. Beyond that, the impeccably fresh seasonal ingredients are visually arresting, and resemble a ray of golden sunshine on the plate. Preheat the oven to 350. Scrub the beets removing any debris, roots and green parts. Place the beets on a piece of aluminum foil large enough to fully enclose the beets in to a package. Drizzle the beets with a tablespoon of olio nuovo olive oil, a sprinkle of sea salt, and 1 tablespoon of water. Seal the package by crimping the foil and roast the beets for 1 hour or until tender when pierced with a knife. Allow to cool and then peel. Cut the beets in to six wedges and set aside. Just before serving, whisk the tangerine juice with the Cara-Cara Orange White Balsamic and a pinch of salt. Slowly drizzle in the remaining olio nuovo while whisking constantly to make a vinaigrette. In a large bowl, gently toss the arugula with 1/2 of the vinaigrette and then arrange on a plate or platter. 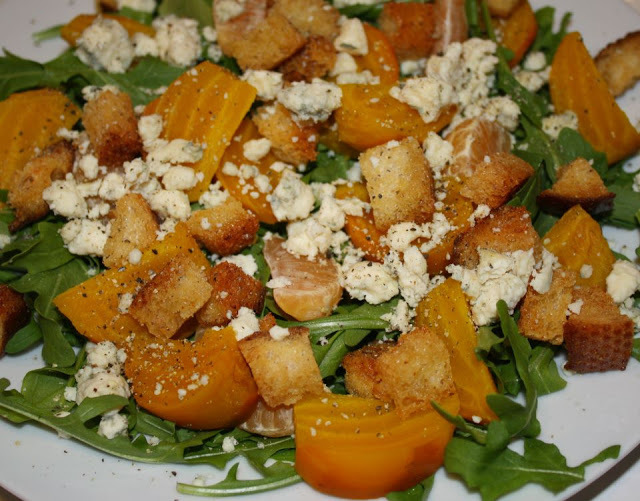 Arrange the tangerine segments, golden beet wedges, and blue cheese over the arugula. Drizzle the rest of the dressing over the top, then add the croutons, and finish with fresh ground pepper if desired. Serve immediately. Preheat the oven to 375. On a baking sheet large enough to hold the bread cubes in a single layer, toss the bread cubes with the infused olive oil. Sprinkle with salt and fresh ground pepper if desired. Bake in the oven for 25 minutes or until the bread cubes are golden brown. Cool and store in a zip lock bag or air tight container.